The Minnesota Vikings are just one football game away from reaching Super Bowl LII. UNITED STATES—This past weekend might have been some of the greatest football games in the NFL I have witnessed leading up to the Super Bowl. I mean so many people dismissed the caliber of the Minnesota Vikings who were battling the New Orleans Saints on their home court. 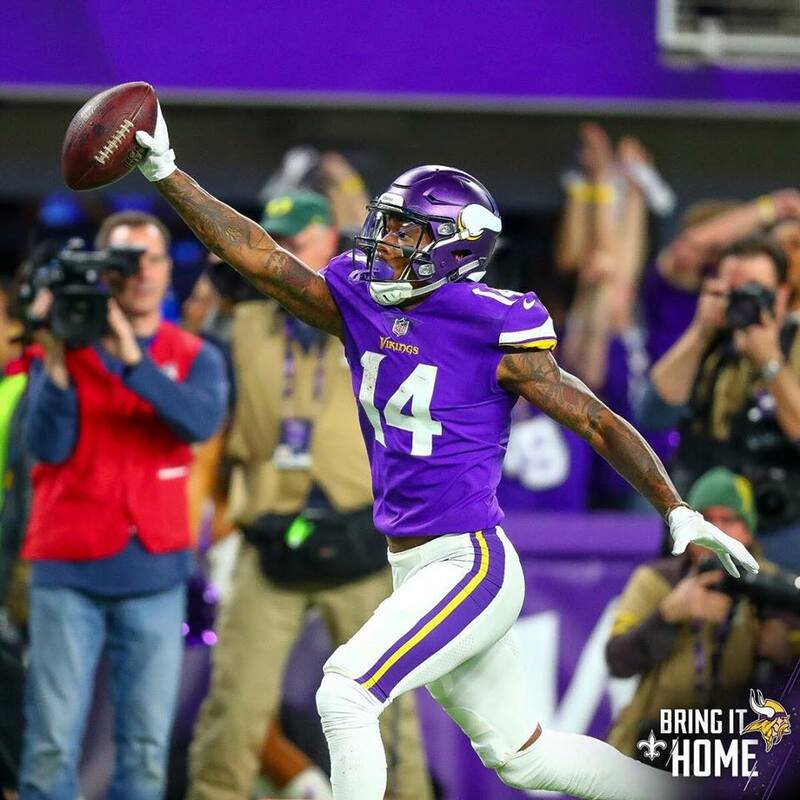 It looked like the Saints would claim victory on the Vikings home turf, but those final seconds delivered a nail-bitter unlike anything seen before: a Hail Mary, a hell of a catch and a touchdown to put the Vikings in contention for the NFC Championship game against the Philadelphia Eagles. That sentiment or disappointment for few can also be echoed for fans of the Pittsburgh Steelers, who saw the Jacksonville Jaguars come to town and just toss the team around as if they were rag dolls. No one, including myself every expected Jacksonville of all the NFL teams to make a run for the Super Bowl, but they are indeed in the driver seat America. The Steelers fought back, but it was a too little too late at that point. I mean Jacksonville defeated a tough opponent on their home turf, so the New England Patriots should watch out, as both teams duke it out for the AFC Championship game. So that brings me to the two battles slated to transpire on Sunday, January 21: Minnesota Vikings vs. Philadelphia Eagles and New England vs. Jacksonville. I will be frank and I don’t care WHAT ANYONE says: I do NOT want to see the New England Patriots in Super Bowl LII. It’s like everyone puts this team on a pedestal for reasons I cannot fathom. Is Tom Brady one of the best quarterbacks to ever play the game? Without a doubt, but the constant red flags of this team utilizing tactics some would call questionable forces me to lose a ton of respect for them. We already know about the Deflategate scandal of 2015 and 2016, and let’s not forget about the team’s head coach Bill Belichick secretly recording footage of other team’s defense signals in 2007. There is something about Belichick’s involvement with that 2007 scandal that I lost a ton of respect for the team. I just find that tactic as dirty and unfair and should have been grounds for the coach to be terminated. With that being said, we know the Patriots have home court advantage as they host Jacksonville, and are the odds on favorites to head back to the Super Bowl. However, people should NOT count out Jacksonville, they might be a tougher opponent than the Patriots expect. If (fingers crossed) Jacksonville takes out the Patriots I will be on cloud 9. Now many expect Philadelphia to dethrone the Vikings, because the team will host the underdog on their home turf. However, let’s say the Vikings manage to defeat the Eagles; it would be a historic moment in the NFL. Why? For the first time ever, a team would have the opportunity to play in the Super Bowl on their actual HOME TURF. Yes, that’s right, Super Bowl LII is being hosted in Minnesota people, so it would be like a Cinderella tale for the Vikings to make it to the biggest sporting event in sports and have the opportunity to fill their home stadium with their fans. I’m really hoping for a Vikings/Jaguars battle for Super Bowl LII, with the Vikings to win it all. This is the NFL people so expect the unexpected, but if the Patriots were to be defeated on their home turf this Sunday it will be a glorious moment for me to say the least. The NFC Championship game is Sunday, January 21 with kick-off starting at 6:40 p.m. EST. While the AFC Championship game is Sunday, January 21 with kick-off slated for 3:05 p.m.